Road Test TV – An Underground Racing built Twin Turbo Gallardo making nearly 2000 horsepower was attempting to set a new record at the Texas Mile on October 23, 2010 when tragedy struck. After passing the mile marker at nearly 240 mph, the driver, Richard Holt, pulled the parachute in an attempt to slow the car down. 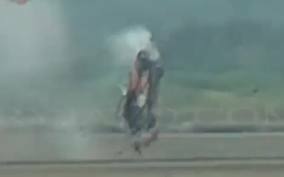 Instead of bringing the Underground Racing Gallardo to a stop, the combination of wind and speed caused the Twin Turbo missile to crash violently. Luckily and unbelievably, the driver, Richard Holt, survived and walked away from this crash. To watch video, click HERE. Click HERE to watch a video of another Lamborgini losing control at the Texas mile.